The 10 winners of F&W's eighth annual Best New Wine Lists award offer outstanding wines from far and wide, even from the tiniest and most remote vineyards (think India, Turkey—and Ohio). The lists, all from restaurants that have opened within the past year or so, generally assume that customers are willing to spend a bit more on wines than they have in the past. Still, each features at least some sensational bargains, as well as a wide range of brilliant food matches. "We wanted to showcase the Napa vintners who might be our customers and tell their stories. There are lots of stories," says general manager and wine buyer Stefan Matulich. 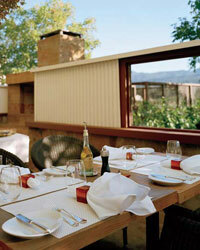 How does a new restaurant make its mark in the middle of hypercompetitive Napa Valley? Matulich created a 550-bottle list of Napa—and only Napa—vintners. Paragraph-long histories and winemaker bios follow dozens of the listings. Plenty of the wineries are small or new enough to be unfamiliar to most outsiders (Ahnfeldt, Diamond Terrace, Waugh Cellars). Press also maintains a modest markup (even less for the more expensive wines), which means lots of wines in the $40 to $60 range—no minor accomplishment in pricey Napa Valley. Best Pairing With F&W Best New Chef 1997 Keith Luce's Moroccan-style rack of lamb, Matulich likes to pour the 2003 John Anthony Syrah ($54), a wine he says "has lush, blueberry fruit and a hint of bitter cola nut that plays off the lamb's mild spices." Best Buy 2003 Provenence Cabernet Sauvignon ($43). "Rutherford winemaker Tom Rinaldi creates this beautifully composed Cabernet in a soft old-world style," says Matulich. "The flavors blend together harmoniously." Details 587 St. Helena Hwy. ; 707-967-0550. "We lean toward wines that are lower in alcohol. No thick and syrupy for us," says wine director Matt Straus. "For the wine list I wanted diversity in flavor, in geography and, most important, in vintages," says Straus. "I'm all about bottle age." He's also about value: Wilshire's globe-spanning, 350-bottle list has a gratifyingly large number of choices in the $30 to $50 range, including the luscious 2001 Marc Kreydenweiss Andlau Riesling ($36) and the 2001 RBJ Theologicum ($49), a dense red Australian blend of Grenache and Mourvèdre. Best Pairing To match with chef Chris Blobaum's poached egg, braised artichokes, lentils and bacon, Straus suggests a 1997 Ferret Pouilly-Fuissé Les Ménétrières ($70). "It has a fantastic acidity but also layers of flavor, because of its age," he says. "It's perfect for picking up the subtle tastes of this dish." Best Buy 1994 Domaine aux Moines Savennières Roche aux Moines ($48). "This wine from a prestigious Loire house opens people's eyes to how intriguing an older Chenin Blanc can be." Details 2454 Wilshire Blvd. ; 310-586-1707. Co-owner and wine director Ricardo Segura has won his bet that Pinot Noirdrinking Oregonians could learn to love Tempranillo. To go with the Spanish cuisine from chef Bernard Malherb, Segura gambled on a Pinot Noirless, all-Spanish list, with a smattering of New World wines made from Spanish varietals. Among the over 350 bottlings are about 100 Riojas, from bargains like the fruity 2002 El Coto Crianza ($26) to offerings on the "Reserva Especial" list like the 1982 La Rioja Alta Gran Reserva 890 ($120). Best Pairing Segura chooses a Rioja, a 1996 Viña Bosconia Reserva from López de Heredia ($40), to go with the chorizo-stuffed squid in saffron sauce. "This wine is earthy and medium-bodied, and although it's red, it doesn't overwhelm the dish," he says. Best Buy 2001 Torres Nerola ($30). It's produced in Catalonia from a blend reminiscent of southern France: Syrah and Monastrell (Mourvèdre). "This is a fairly new style for Torres—big, rich and spicy," Segura explains. Details 1818 NW 23rd Pl. ; 503-227-7282. This excellent 26-page wine list features a changing roster of delightfully unconventional categories. Wine director Sarah Knoefler has created a terrific wine list with some surprising groupings: "High Altitude" for wines from vineyards over 1,500 feet, "Secret Stars" for exceptional wines under $40. Within the categories, the 275 bottles are arranged by color and grape, with an impressive selection of Northern California choices—the list's emphasis—mixed in with similar wines from all over. Best Pairing Chef-owner Bruce Hill's menu shows influences from North Africa, Asia and southern Europe. To pair with his slow-braised short ribs with Thai curry, Knoefler selects the 2002 Domaine La Suffrene ($46) from Bandol in Provence. "It's got lots of dark fruit, a bitter cassis character and the spiciness to stand up to the curry." Best Buy 2004 Pucho Bierzo ($30). "The Mencía grape gives this red from the Spanish northwest lots of licorice and dark raspberry fruit," she says. "People who enjoy earthy Pinot Noir will love this." Details 320 Magnolia Ave.; 415-924-0300. The wine list here is an amazing way to explore unfamiliar European bottlings from Germany, Austria and Slovenia. At La Belle Vie, now in a new location across from the Walker Art Center, wine buyer William Summerville will open any bottle that costs less than $100 if a guest agrees to buy at least half of it (for half price). This is tremendously helpful, given that many of the choices on the 400-bottle, European-heavy wine list aren't widely available in the Midwest. Best Pairing Chef Tim McKee (an F&W Best New Chef 1997) creates inventive French-Mediterranean dishes like asparagus and king crab with sea-urchin custard. Its ideal partner is a 2002 Leth Roter Veltliner ($39), says Summerville. "This Austrian white has the richness to stand up to the strong flavors in the dish." Best Buy 2001 Movia Veliko Bianco ($45). From Slovenia's best winery, this white is aged for three years in new French oak, "which sounds like a disaster, but somehow it doesn't ruin the nuances," Summerville says. Details 510 Groveland Ave.; 612-874-6440. "One of our most popular features is the Brown Bag Experience," says wine steward Lindsey Norton. "It's a mystery wine. We ask people to guess what grape it is." At 94 Stewart, in Seattle's Pike Place Market, Celinda Norton is chef, son Nicolas is the cheese steward and daughter Lindsey is the wine steward. This friendly, New American bistro with an open kitchen and black-and-white-checkered floor has an accessible 240-bottle wine list to match—and it's affordable (lots of wines under $50). The more than 60 Washington choices range from a 2002 Terra Blanca Red Mountain Chardonnay ($24) to a 2000 Leonetti Cellar Walla Walla Valley Cabernet Sauvignon ($150). Best Pairing Lindsey likes to serve her mother's panko-crusted avocado topped with Dungeness crab and corn relish with the 2004 Alexandria Nicole Cellars Destiny Ridge Shepherd's Mark ($40), a Rhône-style white blend from Washington. "It's got a tropical fruitiness from the Viognier and citrus backbone from the Roussanne." Best Buy 2003 Capstone Cellars Yakima Valley Cabernet Sauvignon ($48). Lindsey says this Washington wine has "a pretty, violet nose," She adds, "It's firmly tannic without being overly oaky." Details 94 Stewart St.; 206-441-5505. Tasting menus are the only option here—with each course matched to a different wonderful wine. Alinea, a playful, intimate, wildly experimental 20-table restaurant in Lincoln Park, offers only elaborate 12- or 24-course tasting menus from F&W Best New Chef 2002 Grant Achatz, which you can order with preselected wines or not. The handsome wine list showcases general manager and wine director Joe Catterson's particular passion for food-friendly white and red Burgundies, including such luxe pleasures as eight vintages of Comte Georges de Vogüé Musigny (the least expensive, the 1992, is $350). But Catterson prefers diners to use their pairing suggestions since a single bottle doesn't always work with several different courses. Best Pairing To match with Achatz's squab three ways (pan-seared breast, grilled tenderloin, squab rillettes) with sorrel, Thai long peppercorn custard and strawberry sauce, Catterson serves a 2003 Bilancia Syrah ($65) from New Zealand—"a full-bodied, spicy red." Best Buy 2003 Wieninger Nussberg Alte Reben ($42). "This blend of nine white grapes from Vienna, including Grüner Veltliner and Weissburgunder (Pinot Blanc), has a beautifully fragrant character, complex fruit and plenty of richness," Catterson says. Details 1723 N. Halsted St.; 312-867-0110. The eclectic, fact-filled wine list at this lavish new hotel restaurant makes a great read. Even the appendix is worth studying. Setai cellarmaster Alejandro Ortiz's very pricey, very global (wines from Turkey and India) 550-bottle list is composed almost entirely of selections from family wineries and estates (where grapes must be grown in their own vineyards), and many organic and biodynamic producers. The list has to be eclectic since chef Shaun Hergatt turns out classic specialties from around Asia as well as his own inventive dishes. Best Pairing Ortiz matches sashimi-like salt-pressed Tasmanian trout with a 1999 Clos Floridène ($85), a white Bordeaux that accents the dish's slight sweetness and saltiness. "It gets crispness from Sauvignon Blanc, and melon notes and roundness from Sémillon," Ortiz says. Best Buy Bodegas Hidalgo La Gitana Manzanilla ($45). "This food-friendly sherry is produced in Cádiz right by the ocean." Details 2001 Collins Ave.; 305-520-6400. "Our big advantage," says co-owner Joseph Bastianich, "was that we could spend two years buying and storing wine before we opened." Del Posto's 1,400-bottle list is all Italian (with one concession to France: Champagne) to go with Mario Batali's luxurious, earthy Italian food. There's a major emphasis on Piedmont, including multiple vintages from star producers like Giacomo Conterno, Mascarello, Gaja and Mauro Veglio. Though some delicious bottles go for as little as $39 (a fresh 2001 Arnaldo Caprai Montefalco), most wines priced in double digits count as a bargain on this magisterial list. Best Pairing With the bollito misto, a selection of boiled meats that can include stuffed pig's foot and veal tongue, Bastianich suggests the 1994 Marchesi di Grésy Martinenga Barbaresco ($90). "It's perfumy but won't overpower the meat's delicate flavors." Best Buy 2001 Quintarelli Molinara ($42). "A great buy from a terroir-driven guy in Veneto, it's a red with terrific versatility." Details 85 10th Ave.; 212-497-8090. "We get several calls a week from retailers who've been contacted by people looking for wines they first tried here," says sommelier Michael Tomaselli. "We want to showcase emerging areas and varietals, like Washington Syrahs, and almost any Italian white except Pinot Grigio, like Arneis," says Tomaselli. The restaurant's huge, ever-changing by-the-glass selection typically includes 50 to 65 choices. Best Pairing Tomaselli's match for chef Robert Ledzianowski's halibut with potato confit, peas and shallot jus is the 2004 Pierre Gaillard Le Secret Ivre ($36). He says this Viognier-Roussanne blend has "a floral quality and a little weight to go with the firm fish." Best Buy 1998 Glen Fiona Syrah ($49). Tomaselli says this Walla Walla, Washington, red "has some age, earthiness and uncommon elegance." Details 49 Village Way; 330-650-1883.